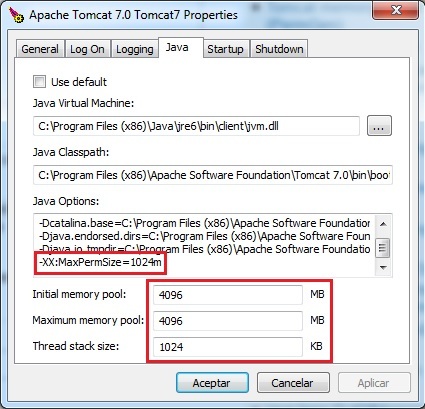 I have tried to modify the Java Options through Apache Tomcat 7 Properties window but after the modifications the server can't start. My computer has 4Gb RAM installed. You should have a small windows application 'tomcat6w.exe' or 'tomcat7w.exe' when tomcat was installed as a windows service. When you start this application it has a tab 'Java' where you can set the JVM parameters. For more details see more memory to Tomcat service. You need to enter only the parameters which start with -X. This work for me in apache-tomcat-8.0.15, but i think it would be the same for all to tomcat's version. Not the answer you're looking for? 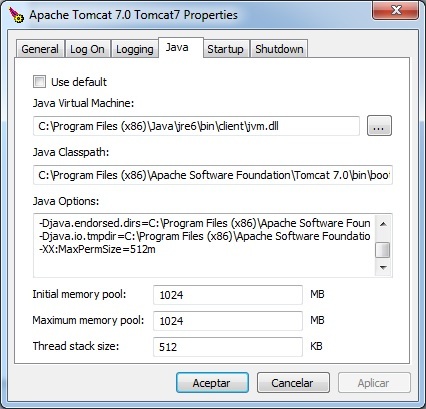 Browse other questions tagged java windows tomcat grails or ask your own question.